It appeared the lore of Camelot, including the love between Arthur and Guinevers, was built on enchanted sand in Once Upon a Time Season 5 Episode 4. Below, TV Fanatics Christine Laskodi, Allison Nichols, Robin Harry, and Christine Orlando are joined by Gareth from Once Upon a Fan to debate King Arthur as a villain, if Rumplestiltskin can be brave and if they bought into Snow and Charmings’ fight in “The Broken Kingdom." Did you ever believe that David and Mary Margaret were working against each other? Allison: Yeah, I was definitely yelling curses at Charming, but I also apologized. I definitely thought Snowing had hit a rough patch and both of them went off to do what they thought was best. They played me. Nicely done. Robin: Man, I was calling David all kinds of names. I completely fell for it. I was totally surprised at the end when he showed up at the dagger's hiding place. Gareth: I had a feeling they might be calling Arthur’s bluff. I enjoyed seeing Regina’s reaction to their little spat though, her face said it all! What do you think about King Arthur being a villain? 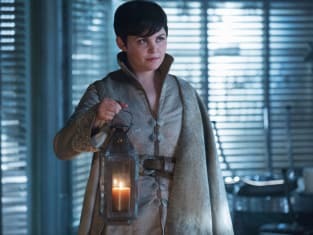 Christine L.: I think it would have surprised me more if Peter Pan hadn’t been a villain back in Once Upon a Time Season 3. Ever since, I automatically assume that every classic hero will end up a villain. I'll admit that it's a nice twist on the classic story though, especially since I really love Lancelot and Guinevere, and the idea that Arthur was driven so mad over the dagger. Allison: It's kinda eh. I'm not really shocked by his evil-ness. The only thing that surprised me was how everything he built and everything he has is a lie. He used the sand to keep Guinevere, and the sand is why Camelot is so great. Robin: Like everyone else, it wasn't particularly surprising. It is an interesting story, though, how he's created this entire life out of a lie, simply because of his obsession with Excalibur. I wonder if the sword itself, in its broken state, has wielded some sort of magical hold on him, as the other part of it has its hold on the Dark One. I'm much more interested in the story of Excalibur than of Arthur himself. Gareth: It is a good twist on the classic tale. I also liked their explanation for why Guinevere is still with Arthur. He had to be using magic to keep her with him since he is such a massive jerk! Christine O.: I was surprised by it as I never saw Arthur as a villain but I’m enjoying the twist. It’s also made me more interested in Lancelot where I hadn’t been in his previous appearances on the show. Do you believe that Rumplestiltskin can be made brave and if so, how? Christine L.: No. 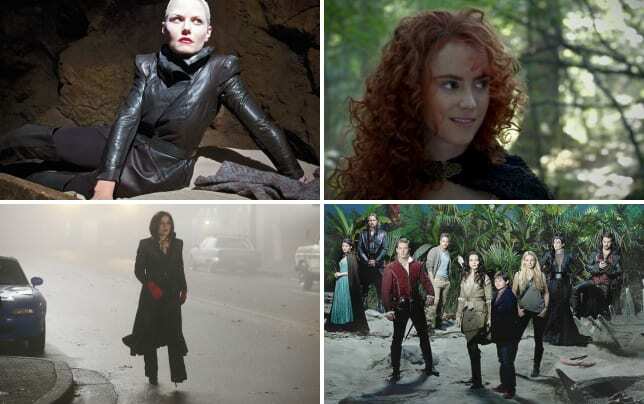 Throughout this entire series, Rumple has never been “brave.” He’s been a pushover, a coward, and the only reasons that he gained any confidence at all involved him being the Dark One. Rumple needs magic to be brave, specifically Darkness. So unless Emma is going to have Merida cast a spell on him, I’m not buying it. Allison: I'm excited to see Merida try, but like Christine said, Rumple has always been a coward. It's part of his DNA at this point. If Rumple ever becomes brave, it will happen over the span of months if not years. Robin: That made no sense to me. A person can't make another person brave. If Rumpelstiltskin does somehow become courageous, it will not be through Merida's efforts. It will be because he's finally found something that's more important to defend than his own skin. He's never had the chance to love Belle as himself, only as the Dark One. Maybe she can be his reason to be brave (now the Josh Groban song is stuck in my head). Gareth: Gold seems to have reverted to his cowardly ways pre-Rumple so I think Merida is going to have her work cut out. Hopefully this will lead to some scenery chomping acting for Carlyle and Morrison, they are the best thing about this season so far. As for how, Gold has shown bravery of his own volition in the past. Let us not forget that he sacrificed himself to save the whole town from Pan. He has it within himself even if he doesn’t believe it. Christine O. Like Robin, I believe that if he does show bravery it will probably be to save Belle. I can’t imagine that Merida will have much to do with it but we’ll have to wait and see. Did anything in "The Broken Kingdom" disappoint you? Christine L.: The entire story about Guinevere is so sad! She’s such a strong woman with this amazing love triangle, and to know that her husband is basically magically holding her prisoner makes me want to throw things. Also, there wasn't enough Regina in this episode. I needed some more of her humor for balance. Allison: I'm not a huge fan of the legend of King Arthur, so I was kinda bored for a lot of the episode. We jumped around time so much, and it was a little much. I would have rather focused more on our core characters. Robin: Arthur's back story was interesting, but a little long for my tastes. I'm itching to know more about the history of the sword, and of Merlin. Do we get some Morgan Le Fay up in this madness? Gareth: More time line and continuity issues in this episode. The episode stated that Lancelot and Arthur met Rumple five years ago when they visited the Dark One vault. Five years ago, Rumple was in Storybrooke as Gold stuck under the first curse!! I’m increasingly thinking that seasons should also be broken down into 3-4 mini arcs rather than 2 main story arcs a year. it feels like we tread water for about 8 episode before the story gets anywhere. Christine O.: All of the time jumps in this episode really made my head spin. I found it hard to keep up with where everyone was in the story and that was frustrating. Christine L.: “Those two can outlive a cockroach.” Regina spoke for everyone who rolls their eyes whenever Charming and Snow are in ANY type of trouble. I also loved the Hook and Emma scene where he promised her that he’d never stop fighting for her. That scene, combined with knowing where they end up after she goes Dark… it’s like the writers stabbing me in the heart with their own dagger. 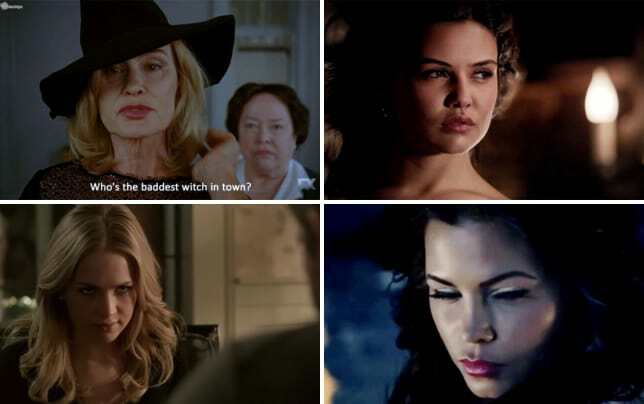 Allison: Killian's reaction to Henry mentioning Violet was absolutely priceless. His face was hilarious. I loved that little scene so much. I'm going to need more of Killian either helping Henry with Violet or even just talking to him about her. Robin: I'm with Allison. Oh my goodness, Hook's utter glee at Henry and Violet was the best thing ever. Hook couldn't stop grinning, and neither could I! I loved every second of that scene. Gareth: OMG. The scene at the end. I thought I was high or something. Did Emma actually have Merida tied to the front of her car like Penelope Pitstop? Has she been there all this time since they got back? I laughed so much, I was nearly crying. I don’t know why I found it so funny but it was one of those surreal moments in the show where you stop and question what you are watching! Hilariously entertaining. Christine O.: Hook was just wonderful throughout the episode. From his glee over Henry finding first love to his devotion to helping Emma combat the darkness. How can anyone not love that pirate? 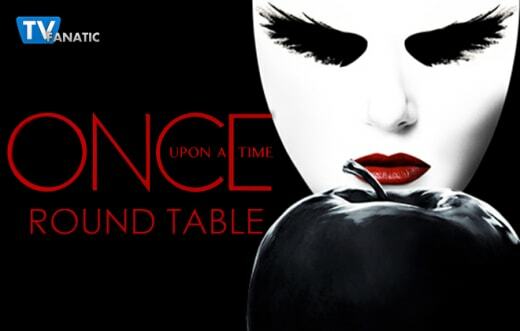 Check back on Sunday for our review of Once Upon a Time Season 5 Episode ? 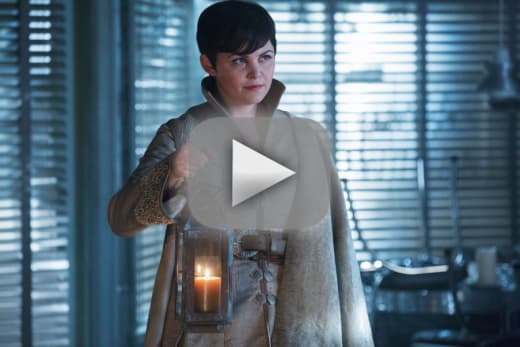 and if you can’t wait for more magic, you can watch Once Upon a Time online here at TV Fanatic. Be careful. Love is a weapon, Deary. The most dangerous weapon of all which means the pain you should worry about isn't the kind inflicted by a broken sword but the kind that comes from a broken heart. Hook: You can hide buried treasure or a winning poker hand but you cannot hide the bloom of first love. Emma: Yes, he has a crush and he straight up lied to my face and I'm the Dark One. Hook: To him? That's up for debate. Permalink: To him? That's up for debate.